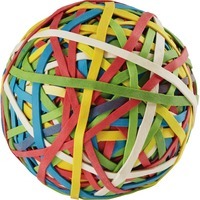 Rubber band ball is an efficient, easy way to organize rubber bands. Approximately 275 bands per ball. Comes in assorted colors. Box. Ball size 3.25 x .125.